Coleman is one of the industry leaders and most popular brand of hot tubs currently to be found on the market. For all spa and hot bath lovers, Coleman is among the first choices they think of. If you’re looking for the luxury of a top rated jacuzzi experience on a budget, here are the best Coleman hot tubs options to consider. Not only these hot tubs are more affordable than some of their counterparts from other brands, but they also have the great advantage of being inflatable and thus portable. Whenever you want to set your up someplace else, you can deflate and re-inflate it in a matter of minutes. All this without sacrificing any of quality, of course. Here are our top rated Coleman spa options and some pre-buying considerations for helping you choose the best one for you. The Coleman SaluSpa model is one of the most popular from this brand’s portfolio. 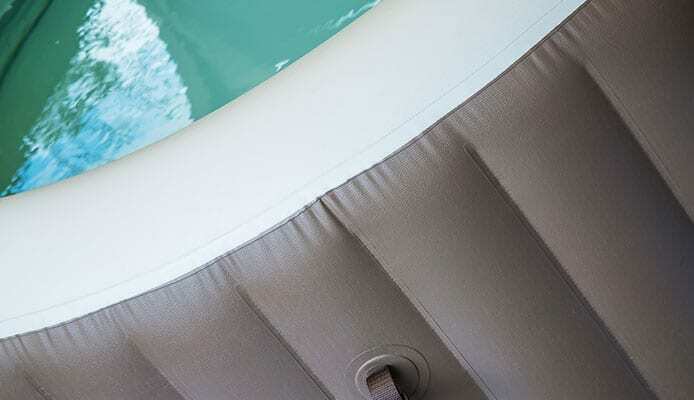 This one can seat 4 people comfortably, inflates in just a few minutes (with the help of an air pump, of course) and is just as durable and reliable as any granite-set hot tub. The soothing bubble jets are digitally-controlled from a soft touch control panel, so you can sit back and enjoy the uniquely relaxing experience. The branded AirJet system has the certified power of 114 air jets, so you can be sure your new Coleman jacuzzi is as powerful as any 5-star hotel bath. You’ll feel like in heaven once you heat it up, start the jets and step in your new top rated Coleman spa. As for any extras you may wonder about, there’s no need to worry: this model comes with a pool liner and a pool cover, a spa pump to help you set it up as easy as pie, 2 filter cartridges and a chemical floater for keeping the water clean, an air pad protector and a repair kit. 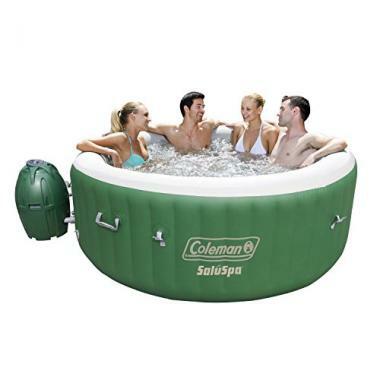 Another popular Coleman SaluSpa model, this 4-person hot tub is a great choice for those looking for a highly portable tub. 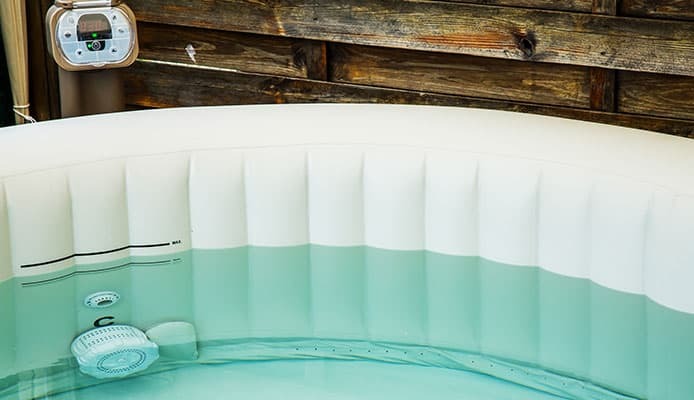 Not only it inflates in a matter of minutes, just like all of the best Coleman hot tubs we will discuss in this guide, but it’s also equipped with 2 handles for an even easier carry. If you only carry it on short distances for a quick move, you don’t even need to deflate it beforehand! This Coleman jacuzzi has the power of 120 air jets that will work their magic to help you become instantly relaxed. At the mere touch of a button, the soft air bubbles will envelop you and your family immediately. The heating system of this Coleman SaluSpa model also promises to heat the water more rapidly than similar models, so if you just need a nice hot bath at the end of a long day, this is the best Coleman spa for it. Also, it comes with all the accessories you could possibly need to help run and maintain it, so you really have nothing to worry about post purchase. If you’re looking for a Coleman 6 person hot tub, this is the best option to consider. You may have also heard about the advantages of a Coleman Lay Z Spa inflatable hot tub, but in our opinion the SaluSpa model is superior to it for home use. It’s super-comfortable for up to 6 people but also easy to run and maintain, and controlling it is super-easy and convenient. Even the heating system is automated so you can leave all worries behind and just relax in the soothing bubble jets. The inner walls of this Coleman SaluSpa tub are made of the branded TriTech material which provides more comfort and durability than some of the competing fabrics of other models. The package includes all the accessories you will need for installing and running your new hot tub, so you don’t need to fret or research what other extras you should get. It even includes a heavy-duty repair kit for future troubleshooting. Still not convinced or decided on what the best Coleman spa for your needs is? Here is what you should look into whenever deciding on a particular model. All of the best Coleman hot tubs are easy to set up; this is actually one of their main advantages and reasons for their popularity. You won’t find a Coleman model which is hard to set up, so as long as you’re only considering models from this brand, the ease of set up shouldn’t be a concern. The capacity of a hot tub isn’t directly related to its size. Some models which appear smaller on paper can actually have a higher capacity in spite of their reduced size. So, make sure you check the figure carefully before making the final decision. As for maintenance, all of the best Coleman hot tubs are pretty easy to take care of and come with the necessary extras to do it. To help you get started, we’ve written this beginner’s guide to hot tub and spa maintenance. There are tons of hot tub health benefits for virtually every model you can choose. Still, some hot tubs can come with some extras, if they offer a particular health-oriented feature. Check the labels and extended product description to see if it’s the case. Regarding accessories, all of the best Coleman spa options in our top include all the accessories you need for installing and running your hot tub. You will also get a pool cover to help maintain the cleanliness of your hot tub when not using it. The best Coleman hot tubs presented in our top above can accommodate 4 or 6 people. Depending on how large your family or friend group is, you need to decide how large your new Coleman jacuzzi needs to be. Hot tubs can be square-shaped or round, and the best Coleman spa options make no exception. One shape is not superior to the other so choosing one should be a matter of personal preference. There are different types of jets used by the various brands of hot tubs on the market. Some are directional jets, some are massage jets, and each of these can vary in shape and size. This variety can result in different sensations on your body if you’re standing close to these jets. For the best experience, the best Coleman hot tubs come equipped with air jets which can provide the ultimate relaxing feeling. Other features you can expect from a top rated Coleman spa model are a digital control panel with a soft-touch interface, comfortable seats and a reliable cover. The best models from this brand, which made it to the present top, offer all of these. Cleaning your hot tub will be pretty easy as long as you use the extras offered by the initial Coleman jacuzzi package. The filter cartridges, floating chemical pack and so on are meant to keep the users healthy but also to help maintain the cleanliness of the hot tub. As long as you stick to the guidelines and instructions in the user manual, cleaning your spa will be easy. Q: Why Choose Coleman Hot Tub Over Other Hot Tubs? A: The Coleman brand is synonymous to quality on a budget. Whatever products you need from the Coleman brand, they are known for providing top rated quality for a relatively lower price compared to what other brands of the same quality level charge. What makes this brand remarkable, therefore, is that it allows you to experience the luxury of the best hot tub or spa experience without requiring you to break the bank. According to most Coleman hot tub reviews you can find elsewhere, users are amazed with how well everything works and of the quality of everything included in the package. If you opt for a Coleman saluspa or a Coleman Lay Z spa you’ll enjoy a top quality spa experience for a long, long time. Also, even if keeping a tight budget is not among your main concerns, the easy portability of the best Coleman hot tubs is also appealing. The advantage of inflatable hit tubs is that you’re not restricted to using them in the same spot for ever and ever. So, if you prefer varying the location of the hot tub in your home or if you’re even considering taking it along in your travels, Coleman is your best choice. A: First and foremost, this is a matter of portability. The convenience of having a hot tub which you can simply assemble and reassemble on the spot is a pretty irresistible prospect for most of us. Super-useful both on the go (imagine being able to enjoy the luxury of the best hot tubs while on a long camping trip) but also at home. Deflating and packing away your inflatable hot tub once you don’t use it as often is definitely a plus, storage space wise. Also, the price is not a neglectable factor, either. If you’re considering installing a solid hot tub in your home at some point but don’t want to make a big investment before you really think it over, an inflatable version is a great idea. After a month or two of constant use, you’ll get a better sense of what using and maintaining such a tub means. Then, if you’re still keen on the idea, you can go for a permanent fixture, although if you choose one the best Coleman hot tubs your version will be just as good as the non-inflatable ones. Q: Can I Set Up My Coleman Hot Tub On My Own Or I Need A Professional To Do That For Me? 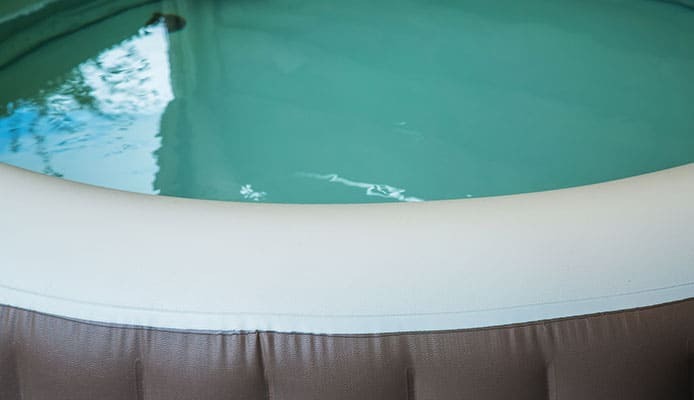 A: Yes, especially considering that the best Coleman hot tubs are also inflatable ones, setting your spa up is easy as pie. All you need is an air pump and the space where you want to set it up. According to seller’s guarantee, you can inflate a Coleman portable hot tub in a matter of minutes. The initial set-up (for when you first get your new Coleman inflatable hot tub out of the box) is also easy to do by yourself, without any help from a professional. Q: What Other Accessories Will I Need For My Coleman Hot Tub? A: Any home spa needs hot tub filter cartridges, hot tub defoamers and some hot tub chemicals in order to operate it. 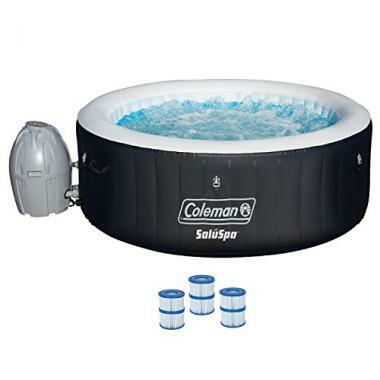 This goes for inflatable hot tubs as well, and the Coleman brand is no exception. Another needed accessory is a hot tub cover for when you’re not using the tub (in order to prevent dirt from getting in). But you don’t need to worry about getting any of these accessories separately. All of the top rate Coleman spa models which we presented above come with all the needed accessories included in the package. Most major home spa brands have similar offers, so you can expect the same from all industry leaders, if you ever want to try models belonging to different brands. Lifesmart hot tubs, Bestway hot tubs and Intex hot tubs are all worthy alternatives to the Coleman hot tub options. Enjoying the relaxation of a hot bath has plenty of health benefits and social benefits. Whether you prefer the sauna or a hot tub session, few things can compare with the rejuvenating effect that a hot bath session brings. Out of all these, the Coleman models are truly something special. We hope our top of the best Coleman hot tubs has helped you reach a decision and that you’re now on your way to becoming the proud owner of an inflatable hot tub. SPA Safety: 10 Things You Should Not Do in a Hot Tub, TheSpruce.com. Did you already have the pleasure of using a hot tub regularly? Why are you considering switching to a Coleman jacuzzi at this time? 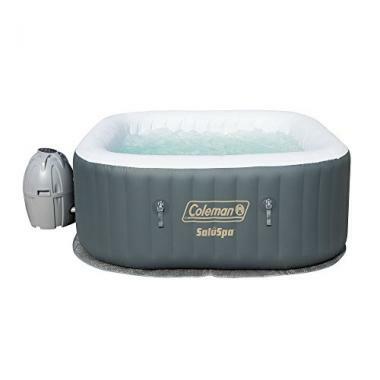 What is the best Coleman spa in your opinion? Are you interested in an inflatable hot tub for your home or also for travel? Please share your thoughts or insights with the other readers in the comment section below!